It’s Good Friday and I’m spending the day at my sister’s house. For some it’s a religious holiday and for others its a no work day. For me, its a mix of both plus a good eating day. 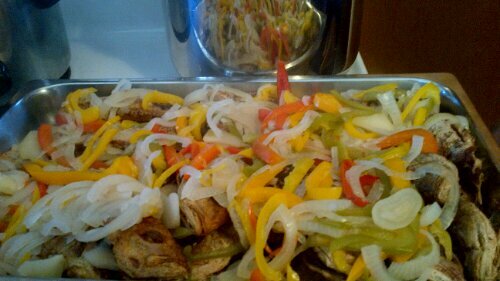 We do ahere to the rule of only eating fish today (google it if you want to know why) but we do it Jamaican style. 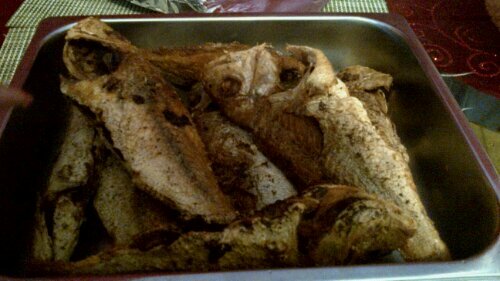 Jamaicans are known for their national dish ackee and saltfish but today we had mackerel and escovitch fish. Escovitch fish is fried whole red snapper. (King fish can be used but I think snapper is better.) You then make a dressing composed of a mix of onions, peppers (red, yellow, orange) scotch bonnet peppers, and chili flakes blanched in vinegar. The dressing is poured over the cooked fish while still hot. Then its eating time. Traditionally, it is eaten with hardo bread and Easter bun. The fish is crisp on the outside and moist on the inside. The tangy dressing and heat from the scotch bonnet gives it the kicks your taste buds into action. This is one of my favourite dishes growing up and still is. On that note, I’m going to get back to eating. Enjoy the day! Your blog looks great too — I look forward to reading more! Oh, and enjoy your time here! Peter! I had an amazing time. I wish I could have stayed longer. Chicago is definitely a city for foodies.